SYNERA® Prescribing Information. Galen US Inc., Souderton, PA; November 2018. Masud S, Wasnich RD, Ruckle JL, et al. Contribution of a heating element to topical anesthesia patch efficacy prior to vascular access: results from two randomized, double-blind studies. J Pain Symptom Manage. 2010;40(4):510-519. Lidocaine 2.5% and Prilocaine 2.5% Cream Prescribing Information. Akorn Inc., Lake Forest, IL; February 2013. Wallace MS, Kopecky EA, Ma T, Brophy F, Campbell JC. Evaluation of the depth and duration of anesthesia from heated lidocaine/tetracaine (SYNERA®) patches compared with placebo patches applied to healthy adult volunteers. Reg Anesth Pain Med. 2010;35(6):507-513. Sethna NF, Verghese ST, Hannallah RS, Solodiuk JC, Zurakowski D, Berde CB. A randomized controlled trial to evaluate S-Caine patch for reducing pain associated with vascular access in children. Anesthesiology. 2005;102(2):403-408. Sawyer J, Febbraro S, Masud S, Ashburn MA, Campbell JC. Heated lidocaine/tetracaine patch (SYNERA®, Rapydan) compared with lidocaine/prilocaine cream (EMLA) for topical anaesthesia before vascular access. Br J Anaesth. 2009;102(2):210-215. SYNERA® (lidocaine and tetracaine) Topical Patch is indicated for use on unbroken skin to help prevent the pain of needle sticks into superficial veins (apply for 20-30 mins) and some superficial skin procedures (apply for 30 mins). SYNERA® is not to be used in patients with a known history of sensitivity to lidocaine, tetracaine, numbing medications of the amide or ester type, or any other component of the product and in patients with para-aminobenzoic acid (PABA) hypersensitivity. Keeping a patch on longer than recommended or applying multiple patches at the same time or one right after the other could result in absorption of sufficient amounts of drug to result in serious adverse effects. Patients should not use SYNERA® if they have a history of methemoglobinemia. If SYNERA® must be used in patients who are more susceptible to developing the condition, they should be closely monitored for signs and symptoms, which may occur immediately or may be delayed some hours, and must be treated immediately. SYNERA® and any other drugs which can increase the risk of developing methemoglobinemia should be discontinued. 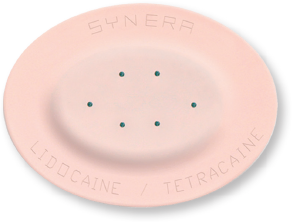 Used SYNERA® patches contain a large amount of lidocaine and tetracaine (at least 90% of the initial amount). Chewing or swallowing a new or used SYNERA® patch may result in serious adverse effects. Store and dispose of SYNERA® out of the reach of children and pets. SYNERA® should be used with caution in patients who may be more sensitive to the general effects on the body of lidocaine and tetracaine, particularly those who are seriously ill or weakened by illness, and those with reduced liver function. Patients with severe liver disease or missing adequate blood plasma enzymes are at greater risk of developing toxic plasma concentrations. Do not use on body passages such as inside the nose or mouth or on areas with unhealthy, broken skin. Application to broken or inflamed skin may result in toxic blood concentrations of lidocaine and tetracaine. Allergic or extreme sensitivity (skin rash, swelling or hives, narrowing of airways, and shock) to the active or inactive components of SYNERA® can occur and should be managed by a medical professional. Seek immediate emergency help if any of these occur. Avoid contact of SYNERA® with the eyes due to potential irritation or abrasion. If contact occurs, immediately wash out the eye with water or saline, and protect it until sensation returns. The application of more than two SYNERA® patches at the same time or one right after another to children is not recommended as it has not been fully studied. Safety and effectiveness of SYNERA® have been established in patients 3 years of age and older. Lidocaine, one of the numbing medications in SYNERA®, has been shown to prevent the growth of viruses and bacteria. The effect of SYNERA® on needle sticks into the skin for certain vaccines has not been determined. The heating component contains iron powder, and the patch must be removed before some diagnostic procedures, including magnetic resonance imaging (MRI). SYNERA® may lead to little or no feeling in the area of the skin where it is applied; therefore, patients should avoid trauma (rubbing, scratching, or exposure to heat or cold) before complete feeling returns. SYNERA® should be used with caution in patients receiving certain heart medications and/or other local pain-preventing medications, because there may be additional toxic effects with lidocaine and tetracaine. SYNERA® should be applied immediately after opening the pouch. Do not cut or remove the top cover of the patch as this could result in a burn injury. If skin irritation or a burning sensation occurs during application, remove the patch and inform your doctor or nurse immediately. Please see Full Prescribing Information including Instructions For Use before using SYNERA®. ©2019 Galen US Inc. PMR-OCT-2018-0044 February 2019.